When transport business Spectran Group decided to upgrade its fleet of trucks, it discovered an integrated solution to support its drivers’ training. 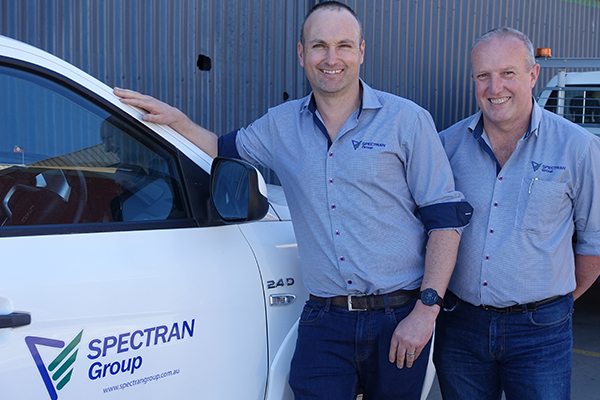 After-sales support wasn’t an after thought for the Tasmania-based Spectran Group, which recently re-evaluated its suppliers amid an expansion. As it expanded its operations across the state, the family-owned Spectran Group has developed a broad approach to business expansion based on five diverse, but interlinked divisions. As an integrated business, Spectran Group focuses on waste management services, including remediation and contaminated material storage; specialised transport and equipment hire, traffic management, civil construction and asbestos management. The company has evolved over 16 years since being established by its Business Development Manager Christopher Hazell. His son, Andrew, is the General Manager of Spectran Environmental Management, one of the group’s divisions. Andrew says the company has evolved over time from a small team to having 80 full-time staff based at its head office in Hobart and operating statewide. To meet its customers’ requirements, the business this year expanded in Tasmania’s north. It’s an expansion that has required investing in facilities, licences and new equipment, particularly as Spectran Group grows its environmental remediation footprint. “We have all the appropriate EPA licences to transport and store these materials. We manage and remediate the materials using third party specialists for National Association of Testing Authorities certified testing and providing technology to ensure we can achieve positive remediation outcomes,” Andrew explains. Diversifying its business required a broad range of expertise across each division. So when it came to selecting a transport industry partner, after sales support was critical to ensuring the company could stay focused on its core divisions. As such, the company turned to Scania in the middle of last year to provide a solution – delivering three P 440 8×4 ready-built Hyva hooklifts and one P360 Hyva hooklift. The order supports Spectran’s skip bin and tank waste removal services and complements its fleet of eight hooklift and compactor trucks. In addition, Scania also provided two G 480 6×4 prime movers tasked with hauling a single tanker around the Apple Isle to collect liquid waste, grease trap cleaning and waste oil removal. Andrew says that Spectran Group previously had a variety of suppliers, including from Japan and the US. After seeing some growth in the environmental waste arm of the business, it needed a new supplier to provide a broader offering. “Scania gave us the overall package for support for servicing and reporting on the vehicle each week,” Andrew says. He says that Scania went above and beyond in its service offering. “Having one point of call for everything has been fantastic. We’re not out to buy on price, we’re after the whole solution,” he says. Andrew says that it’s important Spectran Group look after its drivers and Scania has been able to provide driver trainings on maximising efficiencies and driveability. He says that often the drivers are on farms, working nights and driving in all weather and road conditions so they need to know how to control the vehicle safely. “One driver was having difficulties when driving off road. After a visit with the Scania Driver Trainer he has worked out how to best use the truck’s features and the retarder. He now has better control and more confidence,” Andrew says. By briefing its in-house workshop team, Andrew says the Scania service team has been very helpful and informative. While the hooklift is mainly being used in metro areas, the Scania G 480 prime movers have explored the entire state handling liquids via its tanker bodies. The G 480 is used for tanker transported waste on a line-haul statewide running six days a week. Andrew says this replaced an older American bonneted truck. “Our drivers are behind the wheel for up to 12 hours a day, so they need to be comfortable, safe and happy,” he says. He says that another benefit from Scania is that unlike most other brands, Scania does not only use kilometres travelled as the indicator for servicing intervals. He says it is more sophisticated and bases the intervals on actual usage. “The monitoring system is good because it tells us more than where the truck is, but how it is performing and how the driver is managing it. Fuel, acceleration and braking are all covered,” Andrew says. Spectran’s environment services hasn’t developed by being just a waste transport company, but by looking to provide beneficial outlets and reuse for its customers’ waste materials. “This is a diverse business. We can be a one-stop-shop for a lot of customers, performing many services with just one invoice to process. We are not big in terms of size in some areas of the group operations, but we’re not out to be the biggest, just to deliver outcomes that benefit our customers,” Andrew explains. “Fundamentally the motivation to go with Scania came down to the overall package.